(WEA Japan) 15 Tracks - Japan CD reissue of the original 1968 Reprise album! 11 Daddy, Daddy, What Is Heaven Like? Back in 1965, as their son was nearing 40 years of age, Mrs. And Mrs. Khaury decided to have a talk with him. "You'll never get anywhere singing in that sissy voice," Mr. Khaury told his son Herbert. "I'm sorry to say it," added his mother, "But in all fairness, you'll never be anything." Herbert pronounced that he felt success to be "just around the corner," which was exactly the same thing he had said every year for over a decade. But this year, he was right. Within two short years everyone would know Herbert Khaury. They wouldn't know him under his real name nor under his two previous aliases, Darry Dover and Larry Love. Instead, the world came to know him as Tiny Tim. 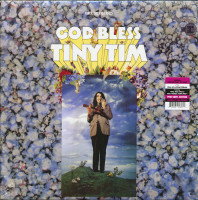 Not only was Tiny Tim not christened 'Tim'; he was not Tiny either. Standing at over six feet with a large hawkish nose and long curly hair, he was a genuinely bizarre sight. His face powdered a pearly pallor and with a delicate pastel circle of coral rouge on each cheek he would respond to applause with a Shirley Temple gesturette, his fingers delicately gracing his lips. The Avon Lady meets Rudy Vallee. Beneath the affectation however, lay an artist who was desperately sincere about his music. Tiny Tim was a human jukebox; a walking compendium of popular music history and pre-history. Asked about the origin of any of his songs, Tiny Tim would relate its provenance with unerring accuracy. That far-off summer of 1968 with its paisley peasant dresses and aroma of patchouli oil and exotic cigarettes was probably the only year in which Tiny Tim, while still looking out of place, would not look as though he had visited from another planet. The time was ripe for a genuine eccentric. Shortly after the final confrontation with his parents, Tiny Tim secured a gig at Steve Paul's club, The Scene, in Greenwich Village. It only paid $50 a week but it soon brought a steady stream of celebrities to his feet to hear him play his "dear sweet ukelele" and sing the songs of bygone eras. It brought offers of television work from Mery Griffin, Johnny Carson and Martin & Rowan's Laugh-In crew. And then it brought Warner Bros. Records, chequebook in hand, to offer him an undisclosed sum to record the debut album under his newest alias. 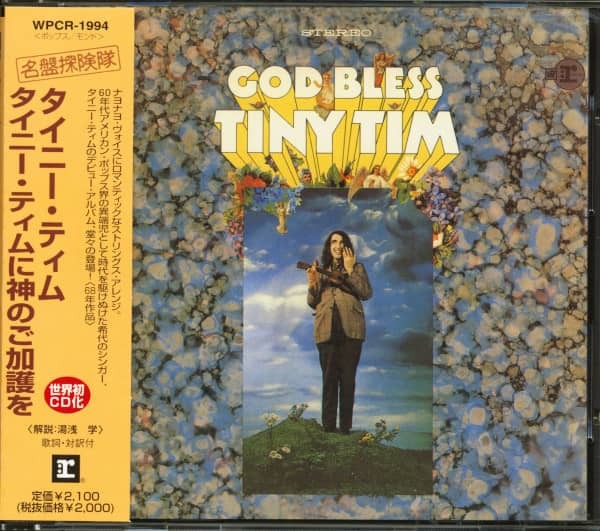 In May 1968, 'God Bless Tiny Tim' and Tiptoe Through The Tulips were released. 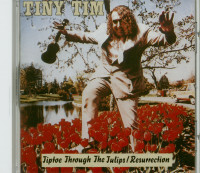 Unlike many others who burst on the scene that year, Tiny Tim had spent twenty years honing his craft. He could sing baritone and soprano, doing duets with himself on songs as diverse as old Jeannete McDonald/Nelson Eddy hits and Sonny & Cher's I Got You Babe. From making $50 a week in 1965, he was suddenly making $10,000 a week. "I don't think I'm turning back the clock doing these old tunes," he told 'Rolling Stone' in 1968. "It's just that the spirits of the singers whose songs I do are living within me. That's why the songs come in the voices of the original singers. I'm not doing imitations, that's the way they sound inside me." "Really, there are three reasons I sing," he continued. "The first is to give thanks to God for the gift he gave me. Number two is to cheer people, whether they are young or old, with a song of the past or present. And number three, and perhaps above all, is because of all the lovely women who with their beauty cause my heart to overflow with joy." One such woman came unto Tiny Tim in his forty-fourth year. Victoria May Budinger, or 'Miss Vicky',took Tiny Tim for her husband in a bizarre ceremony held on a television talk show. She was seventeen years old and soon bore him a daughter named Tulip [after Tiptoe Through The Tulips]. Two years later she bore him divorce papers. By the time Miss Vicky and Tiny Tim were finally divorced in 1977, Tiny Tim was broke. In fact, he was bankrupt. Little outside molecular movement can compare with the speed with which a novelty act is ditched by the American media. His divorce and bankruptcy made a few small headlines but otherwise the media blackout was all but complete. It was as if Tiny Tim and his dear sweet ukelele and his songs of romantic love had never existed. 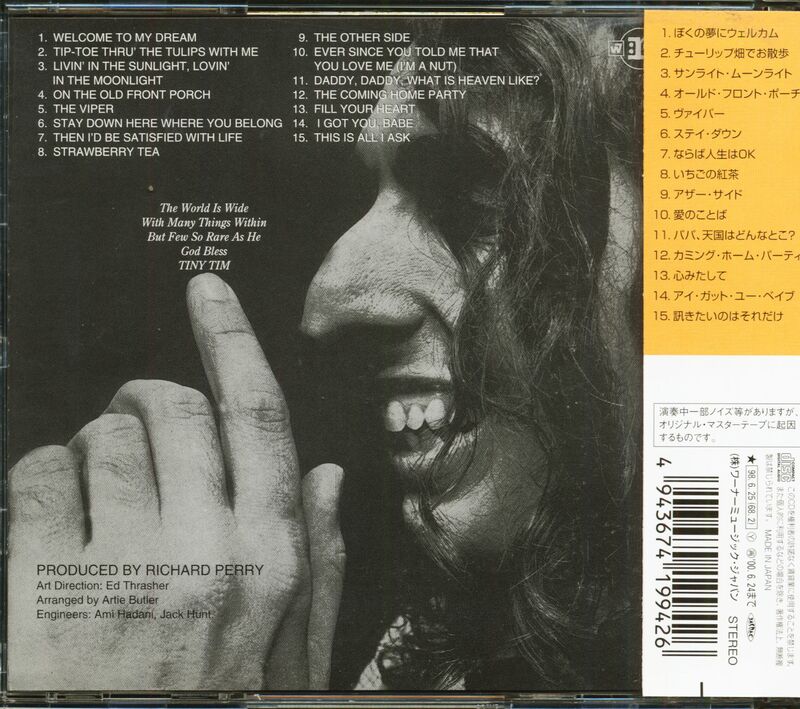 However, these recordings, considered by many to be his finest work, show that Tiny Tim is a true musical eclectic. His interpretative skills are undimmed and he adds a new dimension to even the most familiar material. Perhaps the true reason that Tiny Tim is still with us is that he was never truly a novelty act. The fact that he now makes his living in a circus might seem to belie that fact, but one listen to the songs on this compact disc shows that Tiny Tim has an enviable grasp of what made the gramophone turn at the dawn of contemporary popular music. Those days when records were an inch or so larger, several ounces heavier and held but two songs, either or both of which be accompanied by a dear sweet ukelele rather than an oppressive synthesiser. 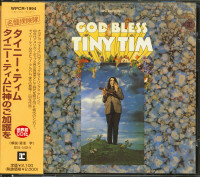 Customer evaluation for "God Bless Tiny Tim (CD, Japan)"